My name is Sharon Watson. I grew up and still live in the Red River Valley of North Dakota and for as long as I can remember, I have enjoyed being outdoors and watching nature. My hobbies include gardening, birding and photography. Most of my birding occurs in my own backyard. I have been a Purple Martin Landlord since the early nineties and love feeding the various species of birds that live and visit my yard. In fact, I have created a backyard habitat for birds and other wildlife. It is not uncommon for me to see Chickadees, Nuthatches and Woodpeckers, or Squirrels visiting my yard. My favorite time of the year is during spring bird migration and the nesting season. Identifying bird species can be challenging, so I decided to photograph birds I was unable to positively ID, creating one more hobby to my list…the passion and challenge of photographing birds! I hope you enjoy my pages and develop a passion, too, for creating your own bird habitat and photographing the wildlife that visits you. 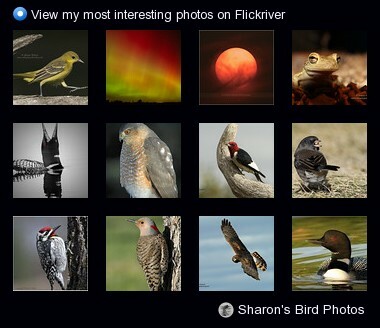 To view some of my most interesting photos Click above on Flickriver Sharon's Bird Photos or visit me on my Flickr Photostream Sharon's Bird Photos' photostream for viewing my most current photos. My images do not belong to a public domain and may NOT be edited, copied, reproduced, printed, distributed, or used in any way without my permission. Please contact me if you are interested in using my photos. © Sharon Watson.